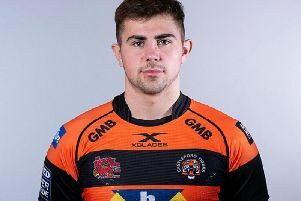 The Rugby Football League have imposed a suspended fine of £5,000 on Castleford Tigers head coach Daryl Powell for entering the field of play during the team’s Betfred Super League defeat by St Helens on March 22. Powell’s punishment, for breaching Operational Rule D1:13, takes into account his acceptance of the breach, and assurance that it will not occur again – as well as the club’s approach and assistance with all aspects of the matter. The £5,000 fine has therefore been suspended until the end of the 2019 season, and will only become payable in the event of further breaches of the Operational Rules relating to non-field personnel entering the field of play outside of RFL Regulations. Powell came down from his usual position for watching matches at Mend-A-Hose Jungle and had a word with winger Greg Eden who had just made an error in the game, but ended up holding play up as he walked across the middle of the pitch. After the game Powell explained his actions: “I was just having a quick word with Greg. But I just wanted to get to the other side and try and organise things for half-time.